LONDON (Reuters) - China must learn lessons from its stock market rout, the country's vice finance minister said on Saturday, signaling his intent to focus on supervision and the development of new frameworks to make it possible to weather any future market turbulence. 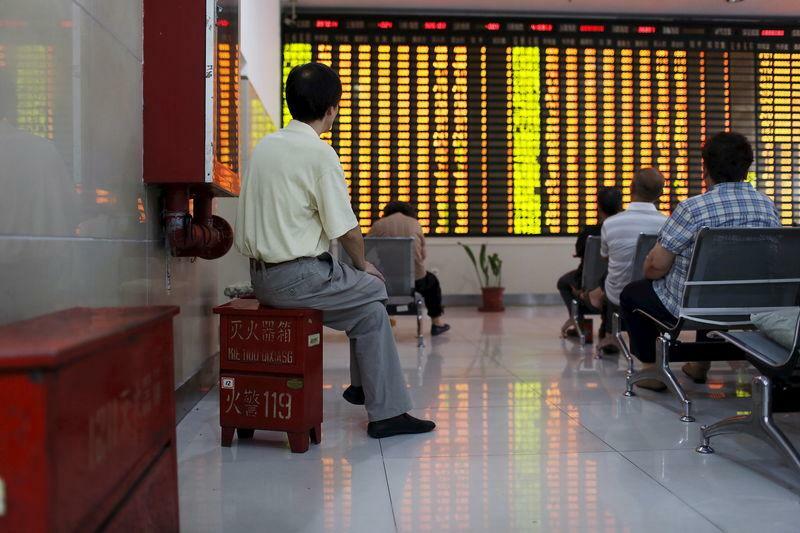 China's stock market plunged by nearly a third at one stage earlier this month from a mid-June peak, wiping around $4 trillion from share values as investors were spooked by speculation that China's central bank was about to end its monetary policy easing. The slide sparked China's biggest rescue effort of its equity market, with the government launching a series of moves that included halting flotations and banning companies and their executives from selling shares. Zhu Guangyao told Reuters Beijing was considering new policies. "There is a mismatch for supervision, and that is a real challenge," he said in an interview at the Chinese Embassy in London. "After the big up and the big down we saw, we need to learn from other countries, mature stock markets including the U.S. and U.K."
The market has bounced in recent sessions and the CSI300 index <.CSI300> of the largest listed companies in Shanghai and Shenzhen rose 3.9 percent on Friday to 4,151.50, up 1.1 on the week. Zhu said China's intervention to stabilize the market was justified given the level of turbulence and that there would now be an evaluation of what had happened to help draw up policies to handle any future market turmoil. However he did not say what other policies might be considered. Some investors have said market reforms and a move towards a market-driven economy, rather than short-term steps such as limiting share sales, are what will nurse markets back to health. Even before panic spread through China's equity market in mid-June, it was shaping up to be a difficult year for the world's second-largest economy, feeling the pinch from slowing growth in trade, investment and domestic demand which was compounded by a cooling property sector and deflationary pressures. State-owned enterprises and private companies, many of which are heavily indebted, have also been feeling the pressure. Zhu said the government would allow some companies to go bankrupt rather than propping them up in order to create a more efficient debt market. "(In) some cases certainly the borrower should take their responsibility, we've been very clear that's a market principle but we also emphasize we must avoid any negative impact to the regional and the systemic financial risk," he said. "We have full confidence that we have the real capacity to (keep) ... our financial system healthy and sustainable". Longer term, Zhu said he was confident China would be able to meet its potential economic growth rate of between 7 and 8 percent over the next five years through instituting market reforms which would enable productivity to rise. Asked if he thought China's 2 trillion yuan debt-swap program, designed to ease refinancing for highly indebted local governments and rev up economic growth, needed to be expanded, Zhu said the size should be sufficient, for now. The program allows provinces and cities to replace high-interest loans with lower-cost municipal bonds with longer-term maturities. Data from the national audit bureau from June 2013 showed repayments by local governments could amount to 1.82 trillion yuan by the end of the year, he said. "In my opinion, 2 trillions will cover all. But of course this figure is from June 2013, so certainly something should be more, but I don’t know how much." Originally, the debt swap program had a quota of 1 trillion yuan, but in June the Ministry of Finance doubled it to 2 trillion. Earlier this month, some media reported Beijing was considering boosting the quota by another trillion. While the debt restructuring helps China tackle its $3 trillion debt burden, the swap program has added supply pressure, pushed out other bond issuers and has been criticized for uncertainty over its scale. Zhu acknowledged the concerns and said Beijing needed to enhance its communication and transparency with the market.